May 1st, 2000 8:00 pm EDT. The Clinton Administration announced the removal of satellite signal scrambling devices. In a matter of moments, civilian GPS receivers became ten times more accurate, effectively increasing location accuracy from 100 yards to 10 yards. This was especially great for civilian researchers such as geographers, geologists, and ecologists. Originally, the 24 Global Positioning System (GPS) was developed for the Navy in the 1980’s. Only the military had full high degree precision use of it for the purpose of national security and the fear of terrorism. Fast forward an entire decade, satellite navigation technology has become a standard in all smartphone and handheld devices. In the same year of the descrambling, a man in Oregon attempted to test the new found GPS accuracy. The Oregon man hid a container and posted its longitude latitude whereabouts online, beckoning anyone wanting a challenge to go and find it. It only took three days before someone with a GPS device found it. Thus began Geocaching; the marriage between adventure and GPS. Geocaching is an online community of adventure seekers who hide various sized capsules and post coordinate location and hints on Geocaching.com and on the phone app. Seekers utilize GPS technology to guide them to cache locations as well as read information provided by the cache hider, like the history of the area. 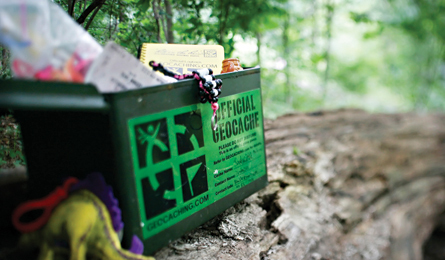 Currently, there are more than 2.9 million geocaches hidden around the world, waiting to be found! Watch this video for more information on what geocaching is! Teachers have begun to show interest in including geocaching into their curriculum to teach a variety of subjects including science, social studies, and geography. Working with educators, geocaching provides useful online resources on its Geocaching and Education dedicated site. Location based technology has the potential to introduce map usage to younger generations that would have otherwise viewed maps as wall-hanging classroom decorations than rather as a highly functional and useful life tool. Geocaching brings hands on experience to common class material like distance, altitude, terrain, cardinal compass direction, and coordinate location. Geocaching also takes part in sustainability measures, influencing it users to be eco conscious while partaking in cache finding. Their initiative CITO (Cache In Trash Out) brings geocachers and community groups to work together to improve parks and outdoor environments by means of cleaning up litter, planting trees, and building trails. It is protocol for geocachers to place caches in areas that ensure plant and animal safety and to enforce environmentally sustainable geocaching. Two additional Geocache initiatives include Trackables and GeoTours and are bringing both adventure and leisure to the world of GPS. Trackables allows a geocacher to track the location of physical trinkets that have a code etched on. The owner may have a message like “Take me to Germany!” attached to the trackable. Other geocachers will find said Trackable and take it with them on their travels, allowing the owner to check its coordinate location online as it hopefully moves towards its destination goal. GeoTours allows people to host tours of their area through “curated collections of geocaches designed to introduce you to new locations” such as Sicily GeoTour in Italy, Azores Islands GeoTour in Portugal, and bermuda Conservation Tour in Bermuda, North Atlantic. Convenient, portable, and reliable GPS devices have completely altered the way we move about day to day. Location based services have become integrated into interactive gaming with Pokemon Go, food hunting with Seamless, shortest route finding with GoogleMaps, and traffic navigation with Waze just to name a few. One’s geographic location is more than just a fixed place. It has interactive qualities with other features of geographical space. Geocaching is yet another useful tool in actively utilizing GPS technology for both practical and recreation.